The Met Office is involved in a number of collaborative projects to assess the potential of new observational networks under the COST framework (European Co-operation in the Field of Scientific and Technical Research). Since the movement of water vapour can transport latent heat and moisture considerable distances, and since water vapour is an important greenhouse gas, knowledge of its distribution throughout the atmosphere is of considerable interest for both numerical weather prediction and climate applications. A new technique to measure the integrated water vapour (IWV) relies on the delay of radio signals received from Global Positioning System (GPS) satellites. The IWV represents the total water vapour content of atmosphere along the path between the GPS satellite and the receiver; most of this is contained within the lowest few kilometres of the atmosphere. The primary objective of COST-716 is to assess the operational potential for a ground-based GPS system to provide near-real-time observations of IWV. 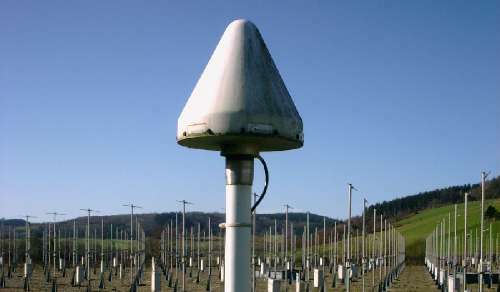 The Aberystwyth instrument is one of several owned by the Met Office within the UK. The data from this instrument are now available through the NERC MST Radar Facility dataset on the British Atmospheric Data Centre. The data represent 1 hour averages.